I need space for cardstock. Then, I need space for the pretty patterned papers. And you can’t forget all of the embellishments, ribbon, punches, pens, alphas, tools, etc.! Oh, and I forgot to mention that I need room for scissors and paper trimmers. It’s a never ending list, I tell ya. …so what do I do with all of those supplies? I create, of course! These next two layouts were designed for my LSS, Memories Live On. They gave me some of the latest products from Sassafras Lass, and they requested me to make a couple of layouts for display. I LOVE the bright colors to these collections! Layout #1: Yes, I used a MS punch… so sue me! I like EK Success punches, just so you know. 😉 …and this layout is also a reminder that you only have a couple more days to get your project submitted in for the latest challenge over at TAAFOMFT. It’s all about your favorite memory. 🙂 By the way, that’s not real stitching; I used Kiki Art‘s funtape. It’s like no other decorative tape I’ve ever used! It doesn’t rub off, and it doesn’t rip when you try to use it! It’s a definite MUST-HAVE! It can’t get any better than that. 😉 I rest my case. What a fun post – and with super layouts too! My studio is a bit messy but I usually keep my stuff all together. Right now I have to keep a certain kit all together by itself but actually if you remember my photos a while back, I don’t really have much stuff. I have not bought a single scrapping item this year or won anything so there are probably more layouts and projects getting done than new stuff coming in. Of course, I receive a Sampler every month just packed with goodies and I receive great stuff from Scrapgal – Maybe you just need to get some of those paper shelves and other stuff like that. Have a great week and lots of fun with your toys! lovin’ the whimsical layouts!!!! I’ve been trying to clean my den a bit too. Just seems the more I put away, the more I end up buying…lol. I’ve been creating quite a bit too. Posted a bunch of new ones on my blog 😉 Looking forward to the weekend so I can create some more 😀 Kisses to Hilo and Maui!!! love love love the lo’s… too to fun!!! and as for the mess… the quote is a fab… I use it all the time… but my hubby doesn’t like it… I do have a ‘studio’… I share with Rainee… but even if the rest of the house is perfect… it always seems to be a disaster… I try… honest I try… I even try cleaning up after each project… but once I’m on a roll… there is not stopping the mess… sad really… but I continue to try harder… well… what can be said… it’s impossible… really it is??!!! Anyway… continue the creating… loving all the lo’s… they are just fab!!! I always find out about cool challenge blogs from you. If you keep turning me on to any more, my whole life is going to be consumed with scrapping for challenges! lol And that wouldn’t necessarily be a bad thing. *ahem* i know you have room for card stock and new patterned paper. *the eye* it is simple. maximization of space through clever organization techniques. =P i put my money on it that i can make room for you in your scrap room to creatively store all your accumulating scrap collection. perhaps it is time for another RAK. haha. btw, i forgot to tell you. i love your latest LOs. it constantly reminds me of the fact that we’re in dire need of a vacation. *cough cough* bora bora *cough cough* st.regis *cough cough* yes? hahaha. I couldn’t agree more…I used to be tidy, then I started scrapbooking and it was all downhill from there. Love your pages (despite the MS punch…hahahaha). I love EK Success punches too, btw. My fav. Sarah, I just adore your layouts! That sassafrass stuff is great! Don’t you just love them? Even when my “space” is clean… it doesn’t really look clean…I’m ok with that, cause it’s fun! Both LO’s are just way too adorable. The clouds & sun make me happy just looking at them! And all the photos are too cute! Have a great day, you craft girl, you! Wish I could get my hands on that new Sass paper. My local store closed down, so I’ll have to get it online. That quote is so true. I can’t ever keep my space clean either! julie — left you LOVE over at deana’s blog. hehe. kat — ummmm i don’t think it’ll fly… just look at gloria’s comments. Beautiful pages! Great Blog too! My dinning room was being taken over by a scrapping monster before my husband set up a room downstairs for me. I love it and right now it’s all tidy… we’ll see how long that will last…lol. Looove those LOs… That stitching looks great… I thought it was real! My scraproom is always I mess too lol… I’m constantly organizing and picking up! It is all in your organization skills cause if I moved all my stuff out of my 6×8 “closet” scrap room. It would take me 2 truck loads…. How do I get a gig like that… I want companies to send me stuff….I need it for the events….We need to talk! These look great Sarah. lol at the puppy pics too. Oh good. My mind is super-creative then. 🙂 Why do you think I invested in that massive paper shelf this week? Haha. I recall a time when all my supplies fit onto one shelf of our bookcase. One shelf. And I was all, “Look how nice and tidy my supplies are. I’m not going to become one of ‘those’ scrappers.” Once again, I’m reminded to never say never. Your mess is justified — you make such pretty things. you said it sister! i just adore you sarah….thanks for the giggles. OOOH my goodness! 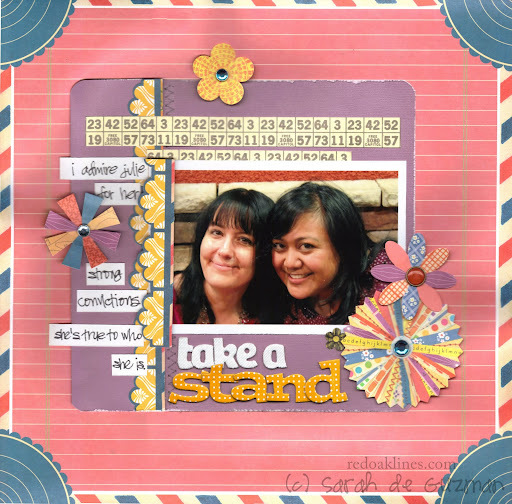 I love both of these layouts… the papers are so much fun!!! I love the picture of you and Julie! Great job on the challenge, thanks for playing along with us at STM! wow – love both LOs!! Happy joyful pages!! Loving your posts and all the replies you get..always make me smile! !Have a great day!! Love, love, love the photo of you and Julie!!! I love all the Sass goodies too!! Awesome layout!! Thanks for joining in the fun at STM! !